You are here: Home / giveaway / It’s Giveaway Time! I promised a give-away for reaching the 200-follower mark... and today I've got a surprise for you! I was super excited when CSN stores contacted me about hosting a giveaway. They have over 200 websites, and I am seriously impressed. Their sites are easy to navigate, and you can get free shipping on many, many items. Score! I love the variety or products they offer... from corner TV stands to exercise equipment, from cookware to even school supplies! (I should have shopped here when I was a teacher.) Go to CSN stores and see for yourself! 1. Become a follower of Oopsey Daisy or let me know you already are. 2. Head on over to CSN stores and let me know what you would buy with your gift certificate if you won. Easy-breezy!! I will leave the giveaway open for 2 weeks and announce the winner on Friday, May 14. 1. You must be located in the U.S. or Canada to enter the giveaway. 2. Although many, many items have free shipping, there may be some shipping charges or international charges (for Canadian readers) depending on the item you choose to buy with your gift certificate. GOOD LUCK! I can't wait to see who wins... this is such a fabulous opportunity! Love your blog – have been a follower for a while now – you have inspired me to make many things I would have never thought of!! it's hard to pick just ONE thing that I would buy from CSN… but a new pair of shoes definately tops the list!! Already a follower! You have such cute ideas! I discovered your site not to long ago and have been a follower ever since. What a great giveaway. It would be a toss up between the Coffee Break Oil Painting (since I'm a huge coffee fan), A toy box for me daughter or one of the children's book storages. Stopping by from Trendy Treehouse's Follow Me Friday. I am your newest follower. Wow, I could spend all day looking at that website, and probably spend a lot of money! I'm a follower. There are tons of things I would love to buy for myself, but right now I'm in the market for a new carseat. It won't be too long before Sophie outgrows her infant seat. i have been a follower for some time… LOVE your site! Adi Designs Je Veux Double Handle Studded Handbag in Pink ! i would buy a new purse! i haven't gotten something for me in a long time!! I love their fun, funky dishtowels. Might actually make doing the dishes more fun. Or maybe not. I am a follower and I love sports locker for my boys sports theme room! We are itching for a playground for my son, so that is most likely what I would be looking at. I am a big time follower. I would buy the vacuum for hardwood floors because I really need one of those! And with a gift certficate, I would definitely get some thing cute for my new little apartment for after I get married! I just became a follower although I have stalked your blog for a long time. If I won I would buy a storage bin or toy box for my lil boy! Okay, so here a few things I would think about buying:) Most likely one of the cute play yards, or a crib, since those are the most important things we will need for our baby coming up. If I won, I would put my money towards the Wildon Home Taylor Wooden Laundry Basket. I have wanted a pretty laundry hamper for so long! I'm a follower, now! Found you by way of Tater Tots and Jello, happy to have found you! And… I would need the "Skyline Furniture Upholstered Storage Bench in Berne Black" SO cute! So much to choose from. After looking around a little while, I think I would use the money towards a sandbox for my 3 little men! I am already a follower and LOVE this blog! Thanks for sharing!! 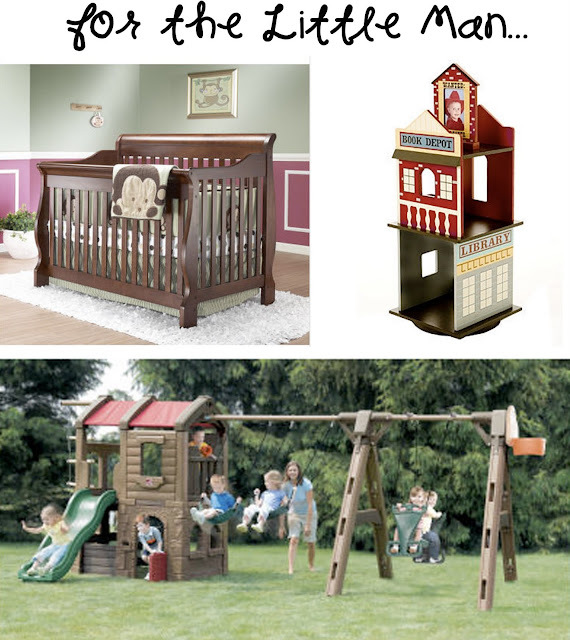 I would use the gift certificate to go towards a playhouse for my daughter…not sure which one yet. I love this beautiful comforter, it is lovely! I love the Sunday Funnies Six Drawer Chest, but may have to get something more practical since I'm obsessed with furniture! It would take me DAYS to decide what I wanted most, but it would probably be something for my kitchen! Thanks for the chance to win! There are so many things I would buy from there. I just purchased a new home, so I'm re-decorating and need so many things! Hi, I found your blog through Tatertots and Jello and am now a follower! Good Sunday evening to you! I have been a follower for awhile. Love your blog! and I would buy the "Howard Miller Carols of Christmas Holiday Table Clock". I love Christmas and all things Christmas too! this clock plays Christmas songs on the hour. Thanks a bunch. One of the comforters would be great! I'm following, I just love your blog, the list of flowers is awesome, I love flowers also! Can I put a link to your flower post on my blog? Hmmm…difficult to choose, but I think I would put the GC towards a bike. I really need a bike! I just joined to follow your blog 🙂 I hope I win! I just stopped by the site and there is too much to choose from. I think if I win the gift certificate would go towards a new outdoor fountain, or planter. My yard could use a make over. I am an old old follower! I am a new follower. I just found your blog. I LOVE IT. Your crafts are soo fun and adorable! If I won the gift card. I would buy a new Hand Bag!! I'd love to get a waffle iron for lazy Sunday mornings! I am a follower! Thanks for the fantastic giveaway! There are so many things to choose from. I would probably use it to put towards a swing set. My little guys would love the sand and water table. If I won, I would buy school supplies – we are starting a homeschool adventure this year! Iwould use it towards a Beltrix carseat! I really want one of those for my little girl! I just found your website. Love it. I would probably buy a wiggle car or scooter for my kids. I'm a new follower & already LOVING your blog! can't wait to browse around some more! Without a doubt, I would buy slipcovers for my couches…they were FREE from family…but not quite my style! I would buy something for my kitchen! Way to much to choose from I would probably get something fo my yard!? I would probably find my hubby something for father's day. Or my baby something. There is too much to try and narrow it down right now!